I truthfully haven't watched any Netflix in a while, so I was excited to get back on Netflix and see that there were some substantially different additions since I'd last watched anything. One of the newer shows that I saw that caught my eye in particular was Evil Genius. It looked like a sort of Making A Murderer true crime documentary, so I figured I would give it a watch. I started it...and didn't stop it, til it was over. I won't lie. The story is a bit confusing as there are quite a few characters all telling different stories, and I was sort of half dozing off during it, but it is really involved and I would recommend the true crime doc to anyone into that sort of thing. A BALDING, middle-aged man shuffles into a bank, waving a shotgun and demanding that a terrified cashier hands over the money. But, as the robber says, this is no ordinary heist - and if staff don't follow his instructions, everyone, including him, will die. To make his point, he lifts up his bulging T-shirt, revealing a live bomb cuffed around his neck with a heavy metal brace. Brian Wells' story sounds like something out of a Saw film, ending with the desperate robber sat cross-legged in a car park, surrounded by armed police and screaming for help as the collar beeps ever faster. But the nightmare was real, playing out on news channels around the world - with an audience of millions captivated by Wells' horror story. 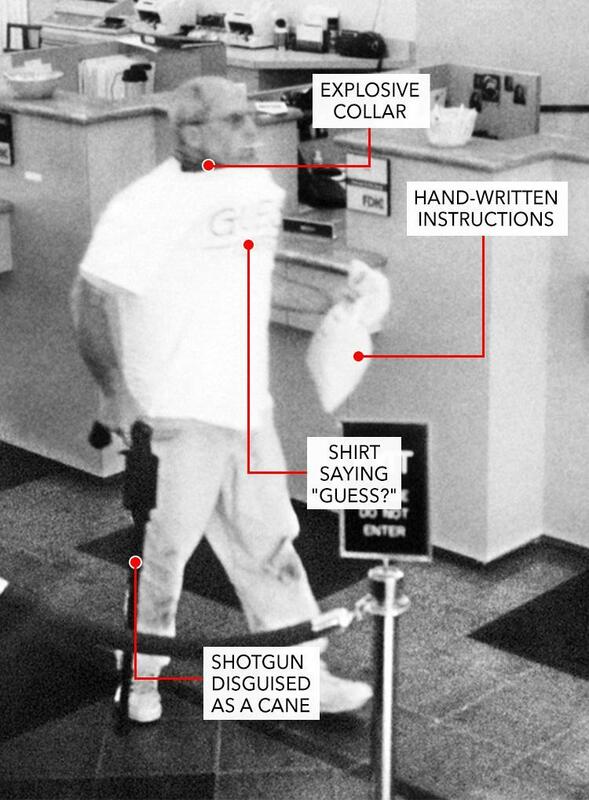 Huge questions about the bank robbery remained unanswered for years after the event, and now a new four-part Netflix documentary, Evil Genius, is revisiting the crime - often described as one of the most complicated and bizarre in the FBI's history. But who was the real twisted mastermind behind the case of the "pizza bomber", and could Wells have played a role himself in organizing the unconventional heist which saw him turned into a human time-bomb? Brian Wells' story started with a pizza. On the afternoon of August 28, 2003, Wells, a school dropout who worked as a pizza delivery man, was sent to deliver two takeaways to an address in the outskirts of Erie, Pennsylvania, where he lived. But after being threatened at gunpoint, the 46-year-old walked away from the scene as a pawn in someone else's deadly plot, with a DIY explosive collar bolted around his neck, a disguised shotgun in his arms and a two-page note addressed to "Bomb Hostage". Wells had been given his instructions: the handwritten note explained that if he wanted to diffuse the box-shaped bomb beneath his chin, he would have to complete a series of tasks within a strict time limit. Completing these instructions would lead him on a scavenger hunt where he would find keys to delay the detonation, and then eventually diffuse and remove the collar. The hostage was also warned that he would be watched on every step of the way, and that the bomb could be remotely detonated if he tried to contact the police. Scrawled at the bottom of the page was the threat: "This powerful, booby-trapped bomb can be removed only by following our instructions... ACT NOW, THINK LATER OR YOU WILL DIE!" For his first task, Wells had to rob the bank on nearby Peach Street, using the disguised shotgun to threaten anyone who didn't cooperate. He drove there in his car and once inside, with a deathly calmness about him, he grabbed a lollipop from the counter, the heavy metal collar bulging beneath a T-shirt emblazoned with the slogan: "Guess?" - a possible taunt to investigators. After strolling to the counter, Wells passed his note to the cashier, warning that they had 15 minutes to hand over $250,000 (£185,000) or the collar would explode. Terrified bank staff readily did as he said, although this wasn't enough time to get anything from the vault. The cashiers could only had access to $8,702 (£6,450) behind the counter, which they bagged and handed to Wells, who strolled out of the bank with the cash and his disguised shotgun. Wells' note then sent him off on a life-or-death scavenger hunt, the collar weighing around his neck the whole time. "Exit the bank with the money and go to the McDonald's resturaunt [sic]," the next instruction read. "Get out of the car and go to the small sign reading drive thru/open 24 hr in the flower bed. By the sign, there is a rock with a note taped to the bottom. It has your next instructions." The two-page note in the flower bed told Wells to go to a wooded area a few miles away, where he'd find a jar sealed with orange tape containing his next instructions. Before he could reach the next step, police responding to the bank robbery spotted a nervous looking Wells about to get into his car. They approached him and arrested him fifteen minutes after the robbery, throwing him to the pavement and cuffing his hands behind his back. When Wells explained that he had an explosive clasped around his neck, police backed away, forming a circular cordon around the pizza delivery man, who sat cross-legged on the concrete. The arrest made for a striking scene, and before long the world's media was centered on the same car park, where a tense stand-off was underway. The explosive collar had been built by a professional, with a complex tangle of wires and sturdy metal case preventing officers from disarming the booby trap. Fake wires were knotted among real ones, with the decoys designed to confuse the authorities as the clock ticked down. "Why isn't anybody trying to get this thing off me?" Wells screamed to the police officers, but with the bomb squad en route, none of them dared to move any closer in case they set it off. Then at 3:18pm, with the bomb squad just minutes away, Wells' collar started to beep, the noise getting faster every second. Wells shuffled backwards, fidgeting in his panic, but he couldn't escape the explosive hanging around his neck. The bomb went off right there in the car park, and he was propelled onto his back with a five-inch gash in his chest, killing him on the spot. Some of the most chilling parts to me, about this story, are the fact that we literally saw him blow up from the bomb. The police couldn't help him get the ticking bomb off of his collar because they had to worry about their own safety as well. They didn't necessarily know if he was a hostage or part of the grand scheme. Also, when Wells brother talks about how the police cared more about the bomb than his brother's dead body, as they had to decapitate Wells to remove the collar bomb to study it, and they lack closure as they couldn't say goodbye as his body wasn't suited for an open-casket viewing.